Evil Dead II (1987) is sometimes considered a remake, though the first seven minutes are actually a quick and imprecise recap of the first film. The Necronomicon Ex-Mortis is a book bound in human flesh and inked in human blood that was designed to resurrect demons. It was lost in the 1300s. Ash and Linda head to the cabin in the woods and find the Necronomicon Ex-Mortis and audio tapes by a professor translating them. After listening to the book, Linda is possessed and Ash has to kill her. Meanwhile the professor's daughter and her research assistant are heading back to the cabin with new pages of the book. As Ash flees the house, the demon in the woods catches up to him and turns him into a deadite. Only a few things have changed since The Evil Dead: the cabin has altered in shape slightly, Ash has no longer rented the cabin and is squatting instead, the shotgun becomes double barreled, Ash has forgotten about the bridge's destruction, and there is no reference to Cheryl, Shelly or Scotty. One of the things Evil Dead 2 does right is that it expands upon the mythology of the force in the book without giving everything away. It also sheds light on who brought the book to the cabin, and what happened to them. Unfortunately, the plot is really thin and we're left with Ash going insane for most of the movie, which was largely what the end of the last film was about. Ashley "Ash" Williams goes into full hero mode. He also goes into full ham mode as the house goes even further in making its torture as funny as possible. The best example is Ash vs. his hand, which goes on for a good portion of the movie, but is quite entertaining nonetheless. However, the best part of Evil Dead 2 is seeing that Ash has learned from the first two films. He becomes a proper badass in this film and the transformation is what makes this film worth watching. The Rednecks, Jake and Bobbie Joe, show Annie and Ed how to get to the cabin. After that they provide some filler as Bobbie Joe gets scared and Jake runs off to find her. On the plus side, they act like actual people would with loyalties to one another and doubts about the insane man with the shotgun. Ed Getley is Annie's research assistant. He is there to get possessed and die. Annie is the daughter of the professor who translated the Necronomicon and one of the people who discovered it. She makes several panicked mistakes as she tries to fend off the woods, including getting Jake killed and nearly killing Ash. She has some genuine moments of humanity when dealing with her dead parents, and she almost moves into the position of love interest, but ends up as just a plot device. The Deadites and the Demon in the woods are more closely linked in this film. When the Demon possesses Ash he becomes a deadite. Though when the demon is unleashed, it no longer needs human bodies to manifest. The more slapsticky foes work for the tone of the film and match up with what they did in the previous film more nicely than one would think. The budget got supersized (compared to The Evil Dead) and the effects work shows it. The makeup is better and the creatures, with the exception of the flying demon at the very end, are awesome. Deadite Linda is a highlight since her dancing among the est examples of horror/comedy the film has to offer. Gotta go into the basement! The woods attack! And tome warp, er, time warp! Definitely not as good as the first. 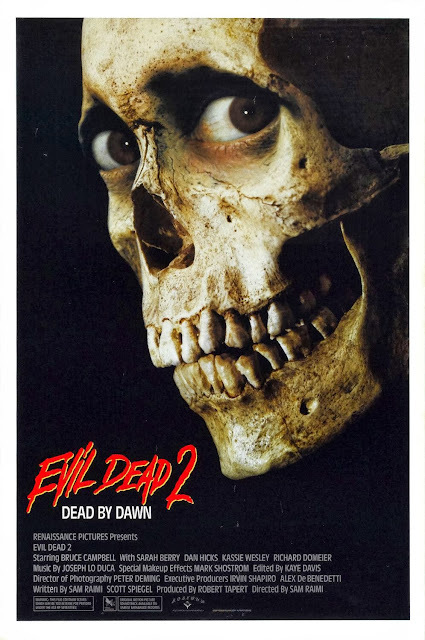 Evil Dead II is really more of a segue into Army of Darkness. To its credit, it doesn't reuse the scares of the original. It takes a new direction and builds on the mythology of the first film. Unfortunately, the introduction at the start of the next film makes this one almost superfluous and shows how flimsy the plot of this one is. However, this one does smooth the tonal shift between the two, and more Ash isn't really a bad thing. See it if you love horror or comedy or both. Be sure to check out DC's review! Next time: Bruce Campbell vs. Army of Darkness! I said "could be considered a remake" i.e. I don't think any of them are remakes except the 2013 one.